Week two has begun for the Office Tour, which is presented in partnership with Emplois Compétences and 102.7 Rouge Estrie. 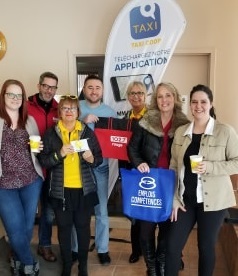 On March 13, we visited Groupe PPD Inc., Mèche Verte, Taxis de Sherbrooke Inc., Axe Visuel, and Antirouille Ami Daniel. It was a pleasure to meet these teams and share a coffee compliments of Promutuel Insurance.